Tuff Torq has invested in new technologies from the raw materials we use all the way to our service and aftermarket support systems. We know the speed of business is always accelerating and having the right tools are crucial to success. Our parent company, Kanzaki, has extensive experience and innovation in the areas of machining and manufacturing machinery that Tuff Torq has integrated in our own processes. We also have exceptional quality and testing facilities to ensure that the products we provide are made to the specifications of our OEM customers. If you want to learn more about the technologies at Tuff Torq, watch this short video. Tuff Torq utilizes several different automated systems to ensure that the products we produce are of the highest quality and our systems are as accurate as they can be. We recognize that full-automation is not the best option for our products or our process. We marry our workforce with our technology to provide a harmony of process that balances the benefits of both. Robotic inventory and storage system for the highest accuracy of production parts and proper manufacturing support. Robotic machining units for highly accurate and consistent parts machining. Automated quality check and process audit systems that won’t allow units to move through assembly unless they pass specific accuracy checks. Automated service parts inventory and order processing systems to provide quick and accurate parts shipping to our OEMs, dealers and distributors. Automated testing systems to ensure accurate and consistent test results for research and development of new products. The Tuff Torq IHT (integrated hydrostatic transaxle) system is truly unique in its design and performance. Our IHT units use the patented Tuff Torq L.O.G.I.C. case system. L.O.G.I.C. stands for Lateral Opening Gear Isolation Case, and it sets our transaxles apart as some of the most dependable and smoothest hydrostatic drive systems available on the market. First, the “Lateral Opening” case is separated horizontally into two main case sections. 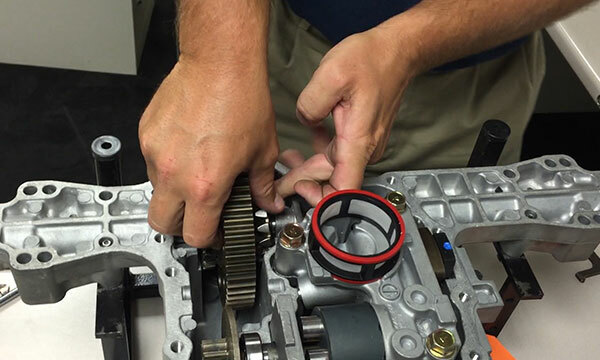 This makes servicing our units much easier for dealers and service departments, since the transaxle can be laid in a stand and serviced more easily and with less clean-up afterwards. Our “Gear Isolation” design means the hydrostatic drive pump and motor chamber is completely separated from the gear drive chamber. The oil, which is used to drive the hydrostatic operation, must pass through a filtration system as it passes from the gear chamber to the hydrostatic chamber. This helps remove any material or debris that has been picked up on the gears before they can damage the precision components of the pump and motor. This gives our units longer life and better overall performance. To learn more, take a look at our products catalog. Now you can have the reliability and serviceability of our tractor transaxles in your zero-turn mower products. Our integrated transaxle drive systems for the zero-turn market are some of the most innovative transaxles available. With features like integrated charge pumps, external hydraulics support and much more—our units are designed to meet the most complicated application specifications in the market. Many of our TZ units are designed with the L.O.G.I.C. case design that has been proven as superior in the tractor market. These units have been proven in the field on some of the most advanced commercial and residential zero-turn mowers available. Tuff Torq Corporation builds some of the most widely used and highly sought after four-wheel hydrostatic drive systems in the world. Versatility of design and extensive reliability history are just a couple of the many reasons to choose Tuff Torq for your next 4WD vehicle application. Patented L.O.G.I.C. design for easy installation, reliability and serviceability. On-Demand (Automatic) 4WD systems available. Knuckle-less design for smooth steering. No driveshaft, so higher deck lift capability and overall clearance. Better stability on steeper slopes. Tuff Torq’s LT, MT and HT Series HST (HydroStatic Transmission) is designed for agricultural and light construction equipment. Dependability, endurance and power are built into each drive system. Check out the information available in our product catalog to find the unit for your next application. More than 60 years of experience in manufacturing excellence. Manual and electric servo control available. Engineered for years of maintenance-free service. Relief valve and charge pump options available. Tuff Torq has produced world-famous drive systems for the marine industry for over 25 years. The drive systems we build are founded on our Japanese commitment to quality and innovation while providing lasting value to our customers. We produce two different styles of marine transmissions; Mechanical and Hydraulic. These transmissions are proven performers in both commercial and recreational applications. Tuff Torq understands that a product is only as good as the company that stands behind it. We are committed to providing our OEM customers and their consumers with the most responsive and dedicated team of service professionals to ensure that our products perform as expected and can be serviced quickly and correctly the first time. Full line of service parts and replacement drive systems kept in inventory at our facility for quick fulfillment to our customers and consumers. RF-based ordering and inventory system to ensure accurate packing and shipping. Extensive network of distributors and dealers in North America and around the world. To learn more, visit our dedicated service website or find your local Tuff Torq dealer.